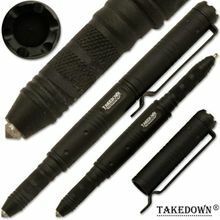 Takedown Tactical Pen features ball point pen and a pointed steel end so it can do some real work. 6 Inch Overall in length with textured aircraft aluminum shaft. Includes pocket clip. Comes in Black, This pen was designed with the military and law enforcement communities in mind. One end is pointed, which could be used as a very effective defense tool (strikes, gouges) while the other end is blunt and could be used as a control device or striking surface. Not only is this pen designed to be used as a defense tool and writing instrument but it also has a very effective glass breaker for either rescue or escape from an vehicle.